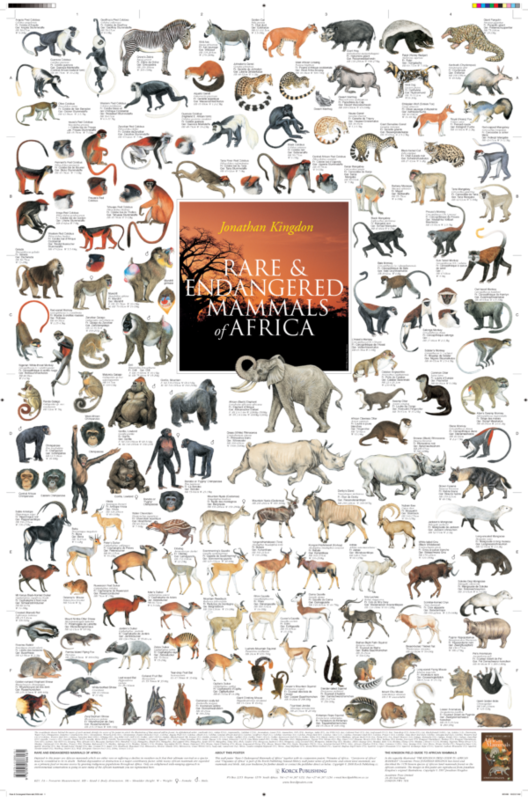 Represented here in the “Rare & Endangered Mammals of Africa” wall poster are 118 species of African land mammals whose futures as species are problematical. Whenever Man has laid his hand anywhere on the entire surface of the Earth the resulting degradation and destruction of the natural environment has always been the harbinger of even worse times to come for natural populations. On the African Continent, where in some areas habitat destruction has reached unimaginable proportions, natural populations are increasingly prey also to indigenous human populations who seek to kill them for their meat, their skins, their horns and tusks, as well as seeking to capture them alive for purposes of trade. Study the beautiful creatures represented on this poster. It rests in your hands whether these remain images of vital creatures who walk the earth, or become a sad catalogue of species lost to future generations.